Last Saturday, four members of a group of 13 medical professionals and students were arrested after joining an anti-mining protest at Maules Creek. Spending more than four hours chained together at the site, the so-called Medics Against Coal felt compelled to act. In March, 92 year old World War II digger Bill Ryan was one of 60 people arrested at the blockade, disrupting construction by sitting on machinery. According to Bill, “I’ll continue to protest for as long as I can walk.” What’s going on at Maules Creek that’s driving so many everyday Australians to put their bodies on the line? Maules Creek is a picturesque agricultural community, situated north west of Tamworth in the agricultural belt of NSW. It lies in the foothills of Mt Kaputar National Park, with Leard State Forest to the south. In July 2013, Former Environment Minister Tony Burke fast tracked an approval for Whitehaven Coal to develop three open pit coal mines in the Leard Forest, thrusting the small farming region into an industrial zone. The Leard Forest is 8000 hectares of bushland, named after the Laird family, who have been farming at Maules Creek for five generations. It was recently identified as a Tier 1 Biodiversity area by the NSW government, areas which ‘cannot sustain further biodiversity loss’. Leard Forest is home to some of the last standing and intact populations of critically endangered Box Gum Woodland, as well as numerous threatened species including the koala and masked owl. Tier 1 areas are not, however, protected from mining. Construction of the three mines will clear more than half the forest, roughly 5000 Ha, including over 500 Ha of White Box Gum woodland. Whitehaven began construction on the Maules Creek mine in January of this year. The coal deposit is one of the largest in Australia, with 362Mt of recoverable resources. Once completed, the mine will operate 24 hours a day, loading coal onto trains to Newcastle where it will be exported to China, India and other coal hungry nations. The $767 million development is one of the largest taking place in the country, with first coal sales expected to occur in early 2015. The mine is expected to operate for 30 years. The mine site holds many significant sites and artefacts for the local aboriginal community. Traditional owners the Gomeroi people are now prevented from entering the mine site, after a dispute with Whitehaven over their failure to preserve items of cultural significance. The long term issue is the coal itself, which when burned will contribute to 30 million tonnes of CO2 per annum, a figure much greater than the total emissions of many developed nations. Considering the annual emissions will be greater than the entire savings from the government’s Direct Action Plan, this is major blow. 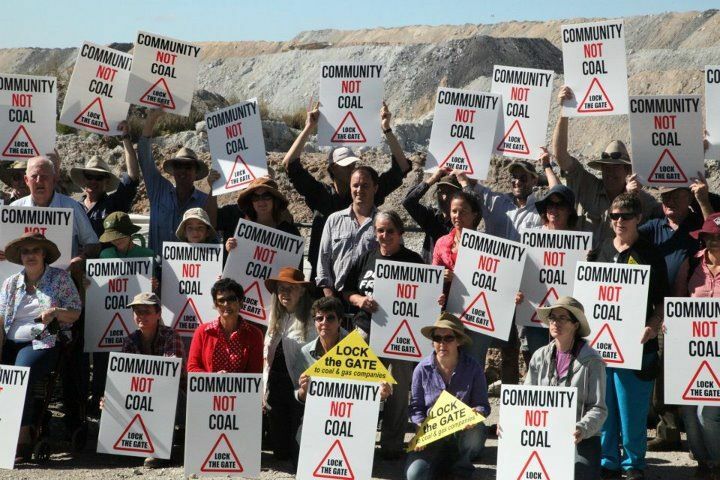 Front Line Action on Coal began non-violent direct action at the Leard Forest in 2012, frustrated that the government had failed to protect the Maules Creek community from the destructive forces of Big Coal. Since then, they have seen the campaign grow dramatically and have been joined by a number of groups such as Lock the Gate, Greenpeace, 350.org and the Wildreness Society. Recently, serious questions have been raised with the misleading information behind Whitehaven’s environmental offsets. Offsetting is a measure that a company must take if it plans to cause ecological destruction. In Whitehaven’s case, they plan to destroy 5000 Ha of forest including 500 Ha of old growth, critically endangered White Box Gum. To offset this loss, they are required to create an equivalent area elsewhere, either through restoration or protection. Crucially, the offset area must contain the same habitat and species as the destroyed area. According to their Ecology Fact Sheet,“Whitehaven has developed a comprehensive Biodiversity Offset Strategy to compensate for the impacts to native flora and fauna.” This has been strongly disputed by independent scientists and ecologists, who argue that up to 95% of Whitehaven’s offset mapping is wrong, containing very little of the threatened White Box Gum woodland. Despite these major problems, a spokesman for Whitehaven Coal insists that the project is proceeding and protesters need to accept it. “The fact that Mine opponents do not like the outcome, or want to pursue a broader anti-coal agenda, does not entitle them to seek to interfere with its progress, and with the livelihoods of our workers and contractors.” With the government fighting with Goliath, it’s unclear if David can ever win. To get involved, visit Lock the Gate or Front Line Action on Coal.